You are here: Home / KidsInclusive Events / Register by March 10, 2017 for a free Run/Walk technical shirt! Register by March 10, 2017 for a free Run/Walk technical shirt! The early registration deadline is this FRIDAY MARCH 10, 2017!!! 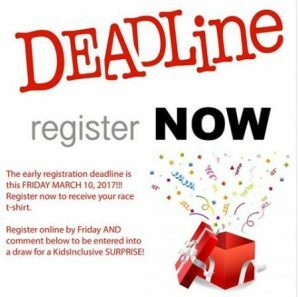 Register now to receive your race t-shirt. a draw for a KidsInclusive SURPRISE! http://kidsinclusive.ca/wp-content/uploads/2016/09/KidsInclusive-EnfantsInclus.png 0 0 Marianne McLure http://kidsinclusive.ca/wp-content/uploads/2016/09/KidsInclusive-EnfantsInclus.png Marianne McLure2017-03-08 19:03:482017-05-02 17:12:23Register by March 10, 2017 for a free Run/Walk technical shirt! SUPERHEROES UNITE! 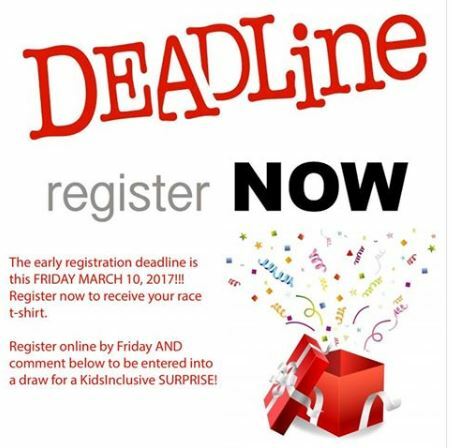 Run/Walk for KidsInclusive is here! See you all this Sunday, April 2nd!